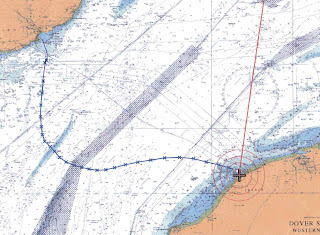 I coxed a nice bunch of blokes over the Channel yesterday, and it was interesting to compare it with PicoMicroYacht's recent crossing. Both took roughly the same time - PMY did it in seven hours, my crew of four in a plastic pilot gig called Angela in seven and a half. With four of them powering a boat more than twice as long they should have been a lot faster, but they were inexperienced rowers and had run a relay from London (about 30 miles each) the day before. Spot the difference in the courses the boats took. PMY went over at a low neap, starting at 06.30 with low tide at 11.30. Angela went on a high spring, starting out at 09.30 with high tide at 14.00. 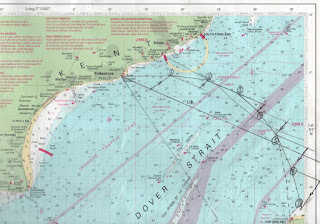 So the boats were swept in opposite directions by the fierce tidal flows in the Strait of Dover. 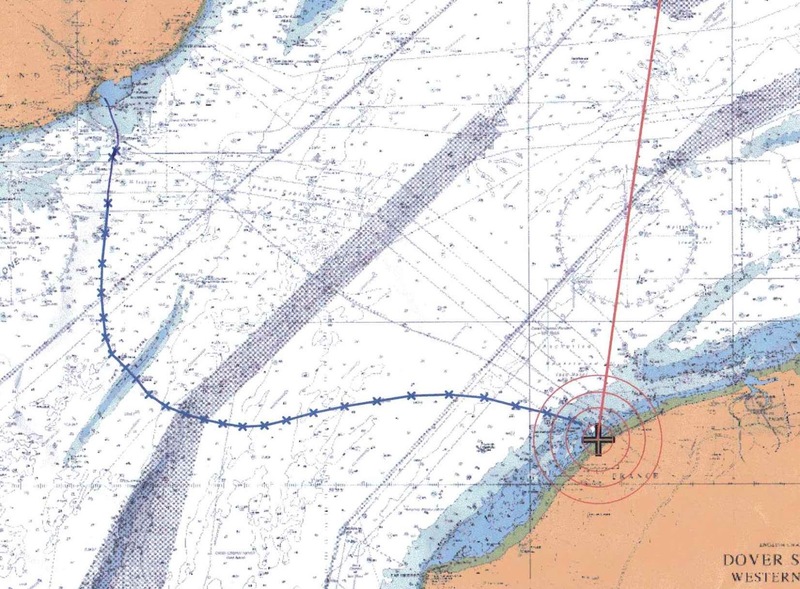 The other major difference in strategy was that PMY did careful calculations on a paper chart, whereas Mike Oram, the support boat skipper for Angela, just set his autopilot to take us straight over. I don't think any of that all that much difference - as far as Angela was concerned, the dominant factor in choosing a crossing time was the current dramatically changeable weather, making finding a day when it wasn't going to be blowing a hoolie and lashing down with rain something of a problem. In the event, the weather was dry and bright, with a fresh breeze and a bit of lumpy swell left over from the depression that whizzed through a couple of days before. Congratulations to Angela and glad you found a good window to cross. Thanks for the comparison. Another difference was that it took me three whole days to feel normal again - without any running! The difference in course illustrates the tidal effects quite dramatically. As a matter of curiosity, did you notice a greater sea state, going over the Varne? I took some time to recover after sitting on my behind all day! There was a very distinct lumpy sea over the Varne which was quite a challenge to the rowers. They perked up quite a bit when it got quieter again. Did you take a support boat with you for crossing the channel. We have a smaller open water crossing challenge to be faced soon, and we need to assess whether a big RIB or other intrusive engine powered craft is desirable. Hi Robbie - there were actually two support boats, as you can see from the next post up. Support is needed because the Channel is one of the busiest shipping lanes in the world and a big support boat is clearly desirable especially as rowing crews are not allowed to disembark at the French side for some reason, so most crews get into the support boat for the return journey. I suppose that for your purposes a rib with enough ooomph to take the boat in tow if need arises will be all you would need, though you might consider one with enough seats to take the whole crew if the worst really happens. Which crossing are you planning? not sure if previous reply went. Please forgive (and edit) if you get this twice. I had better not say where we are going, in case anyone else from Scottish Coastal Rowing nips in and does it first. There will however be no problem with disembarcation, other than being careful to arrive when the pubs are shut so that we can get the crew back in the boat for a return journey. 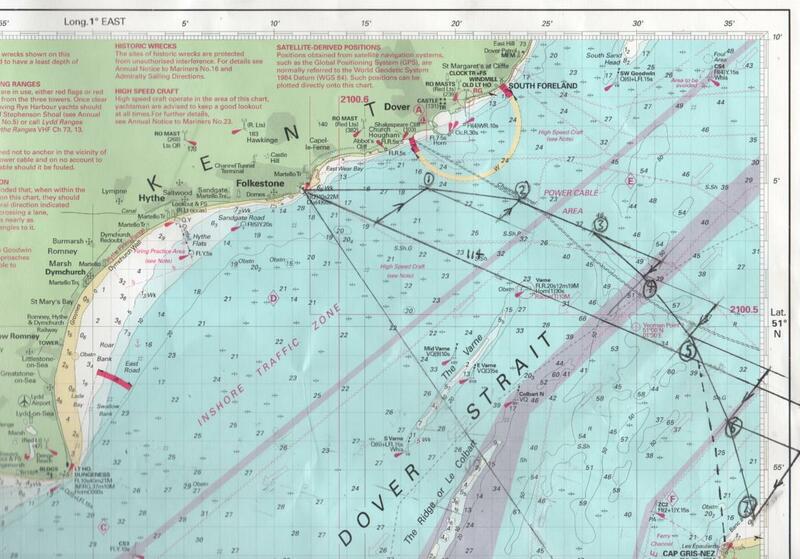 I don't think there will be as much traffic as there is in the English Channel. Well, if you can keep the lads out of the boozer and it all goes well, send us some pictures and a full report. Good luck for the crossing!